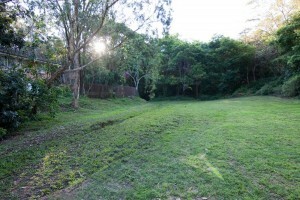 The Couldrey Street Clearing | There once was a creek . . . The clearing at the bottom of Couldrey Street, looking upstream (October 2011). The clearing at the bottom of Couldrey Street has intrigued me ever since I started retracing the path of Western Creek. 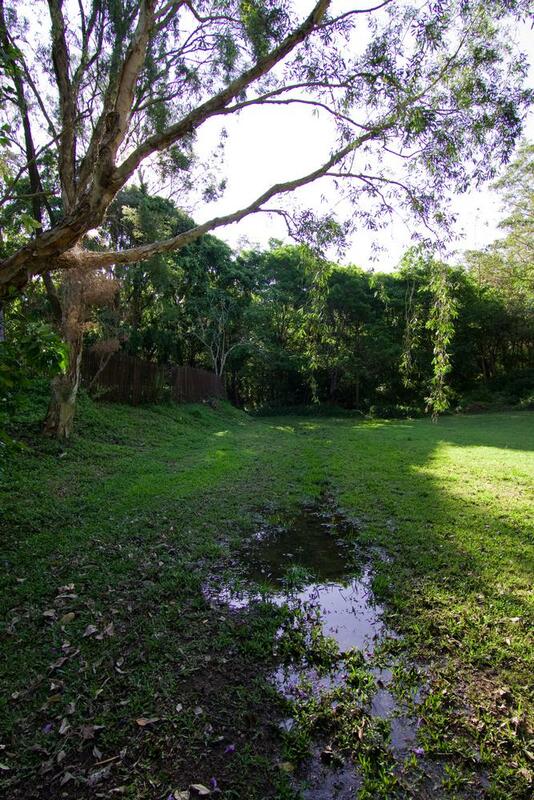 This is where the channels running through the bush around Tristania Drive — the only remaining natural parts of the creek — converge, only to spill out onto a large, waterlogged lawn. Through the clearing there is no identifiable channel, no concrete drain, no underground pipe — there is just a flat patch of grass. 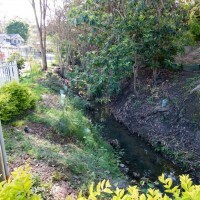 At the bottom end of the clearing, the streambed reappears, passing behind the houses at the bottom of Couldrey Street and continuing to Haining Street where it enters an underground drain which does not see the light of day again until Norman Buchan Park. 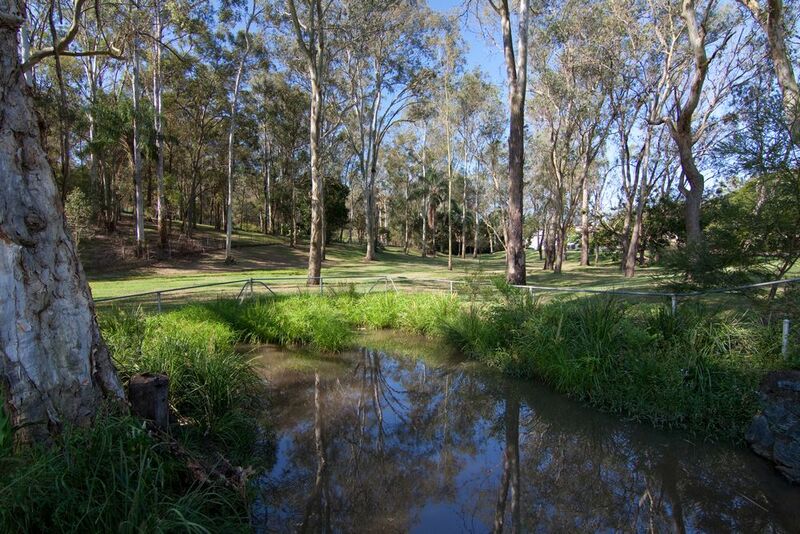 The clearing not only interrupts the flow of Western Creek (when indeed the creek is flowing), but also dissects Couldrey Street into two parts. There is no obvious reason why the road does not continue straight through the clearing. On the other hand, there is no obvious reason why the roads on either side of the clearing are both called Couldrey Street, when they could just as well have been named separately. It’s as if they were intended to be a continuous street, but no-one ever got around to joining them up. The location of the clearing at the bottom of Couldrey Street. View larger map. This place sits in a kind of categorical limbo. It’s where the wild part of the catchment ends, but not quite where the suburban part begins. 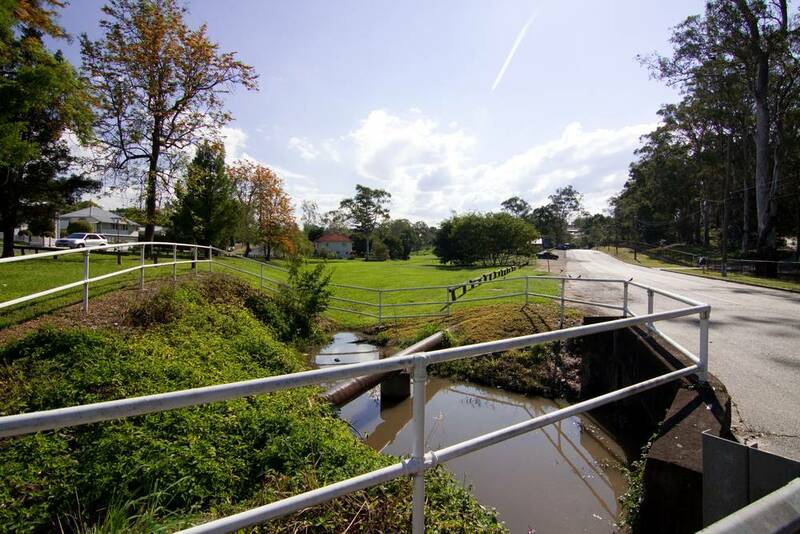 It’s been cleared of trees, but not developed into roads or backyards. It is too small to be a park, but too big and out-of-the-way to be a nature strip. Its history and its reason for being are not readily apparent. I’ve always thought that this clearing must have an interesting story to tell. And by golly, it does! Growing up in Couldrey Street was an amazing experience. It was a very tight knit community. In Couldrey Street alone there were 26 kids that I can think of off the top of my head. We all used to play in the bush, which is now Tristania Street and all the surrounding houses. There was never any houses from Couldrey Street, right through to Stuartholme. It was all scrub. 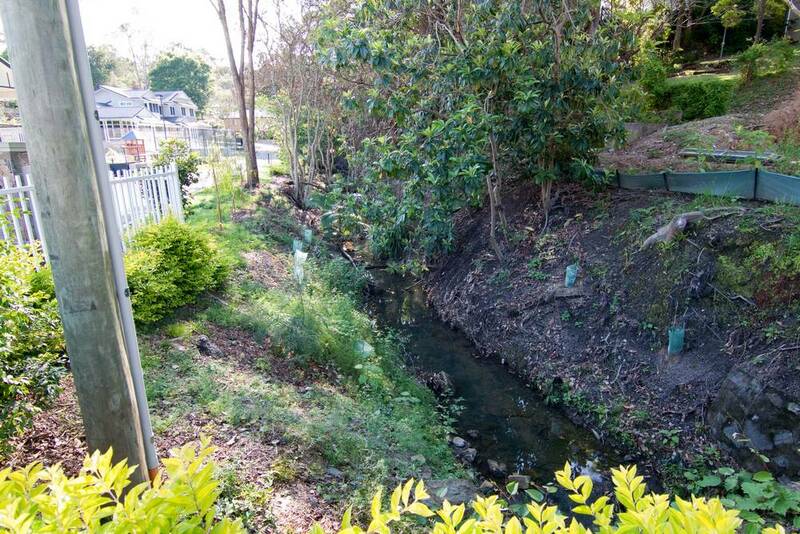 And the creek used to flow at a rapid pace all the way down, parallel with Couldrey Street, in the gully. After a good rain it was possible to jump on a “surf mat” in those days and go all the way to the “mowed” area at the bottom of Couldrey Street that you talk about. It was here that the creek ran into a huge natural waterhole. All the kids used to swim here on a regular basis, foam surfboards, home made rafts were the order of the day. This, to me, was a revelation. The clearing was once a waterhole! This is something I never would have guessed. I had assumed that this was just another part of the creek, but it wasn’t. It was bigger, wider and wetter than other parts of the stream, and thus could not be used or built on in quite the same way. With this in mind, the quirky nature of the clearing makes a bit more sense. But this revelation opened up just as many questions as it answered. How deep was the pond? Did it ever dry up? What (besides water) was in it? Where did the water come from? Was this another spring like the one spanning Fernberg and Norman Buchan park, and the one on Ellena Street that Johann Heussler wrote about in 1864? Is it any coincidence that just downstream from the clearing is another part of the creek (the gully just above Haining Street) that rarely seems to run dry? But while these questions were still bubbling forth in my mind, another revelation came. It is a shame that Auntie Annie is still not here to tell you how the nuns used to swim in the ponds at the end of Couldrey Street and tether the cows for the convent milk at the end of the street. Kids, cows, nuns… this story has it all! The history of this curious clearing ran deeper, quite literally, than I every would have imagined (and this is before even considering what such a place might have meant to the Aboriginal inhabitants of the area). My barrage of questions soon exhausted Jonathon’s childhood memories, so Jonathon did the sensible thing and referred me to his mum. A few weeks later over coffee, Di filled me in on some of the missing details. Di moved into Couldrey Street in the early 1970s, when the area was still being developed. Between Couldrey Street and Stuartholme was all still bush, but in the other direction (towards Rambler and Eastment streets) there was scarcely a tree to be seen. Among the parts that hadn’t yet been bulldozed was the land at the bottom of Couldrey Street. This land wasn’t developed until the late 1970s and early 1980s, and this is when the waterhole met its end. This would have surely been a disappointment to the local kids, but was probably a relief to their mothers! And the convent cows? Their paddock, Di told me, is what we now know as Rainworth Park. The lower parts of the paddock were wet and marshy, which is hardly surprising given that the gully just over the road seems to have a constant pool in it even today. The clearing at the bottom of Couldrey Street (October 2011). The Couldrey Street waterhole is a great example of the kind of history that can literally get buried by urbanisation. And if not for personal accounts such as those of Jonathon and Di Freer, this sort of history may never be resurfaced, for often it is not recorded (or does not survive) in any photos, newspapers or other forms of documentation. Having said that, I’d like to think that someone does have photos of the Couldrey Street pond. It must have been visited and used by so many people over the years, and it might have still existed a mere 30 years ago. So if anyone out there has such photos, or knows someone who might, I would love to hear from you. If you don’t have photos but do have some memories to share, that would be wonderful too. I would like to extend my sincere thanks to Jonathon and Di Freer for sharing their memories of Couldrey Street and this special part of Western Creek. Pingback: There once was a waterhole . . . | There once was a creek . . . Sorry for only just replying to your message–I’ve been ‘away’ from th site for a bit, and the email notifications don’t always come through when someone posts a comment. I’ll get in touch with you privately as soon as is convenient.